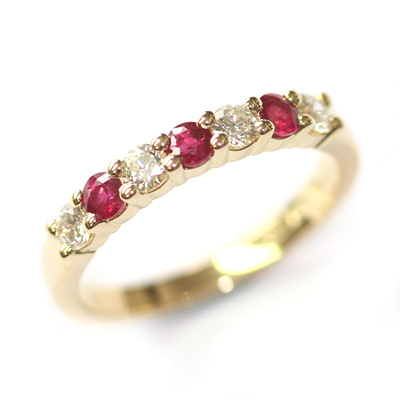 18ct Yellow Gold Ruby and Diamond Eternity Ring — Form Bespoke Jewellers Ltd.
A beautiful yellow gold eternity ring with rubies and diamonds. The customer came to us to create a surprise eternity ring for their partner that would match their other special jewellery. At the centre of the design are seven alternating stones; round brilliant cut rubies and round brilliant cut diamonds. Each stone is hand set in a four claw setting which provides a neat and classic finish. 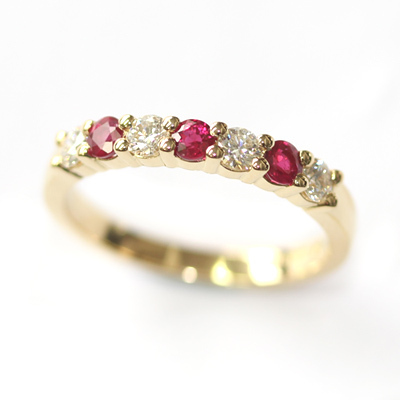 The ring is also cast in 18ct yellow gold which complements the ruby and diamond design beautifully.